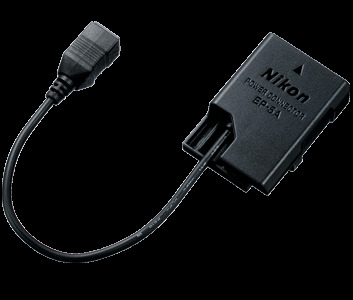 Buy New Nikon EP-5A Power Supply Connector for DF, D3100, D3200, D5100, D5200, D5300, P7000, P7700, P7800, P7100 Malaysia At FotoZZoom! Connect EP-5A Power Connector to the EH-5 or EH-5A AC adapter for extended shooting capability. Required when using EH-5a AC Adapter with D5100 and D3100. Simply insert the EP-5A into the battery chamber and the camera will be powered by continuous AC power instead of the D-SLR's rechargeable battery. The EP-5A is a Power Supply Connector that is required when using the AC adapter EH-5/EH-5a to power the camera.